Cut beef into 2-inch cubes and season with salt and pepper. Sear in oil; remove beef and sauté onion. Add garlic and sauté. Deglaze with red wine. Add reserved beef and prepared demi-glace. Braise covered in 350°F oven with thyme and rosemary sprigs for 2.5 hours or until tender. 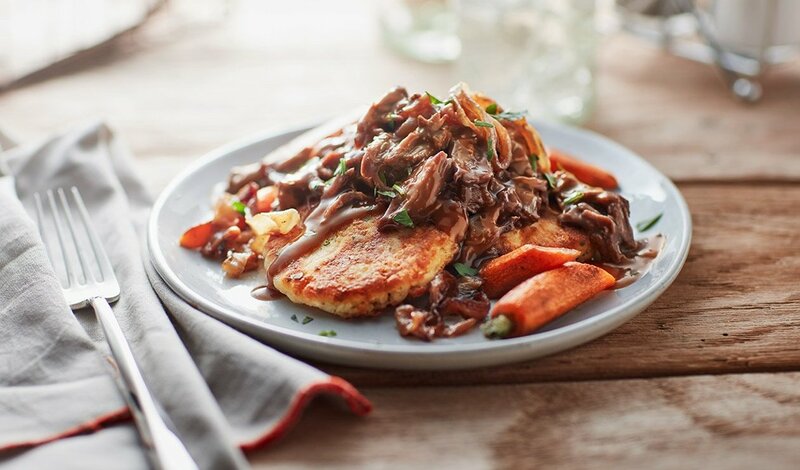 Top potato pancakes with shredded braised beef, caramelized onions,carrots and reduced braising liquid. Garnish with parsley.